When it comes to implant dentistry, Dr. Rapoport has seen it all. “Through my many years of training and experience in implant dentistry, and also from seeing the kind of issues implants develop if the implants and new teeth have not been placed correctly, I have isolated the main factors to look out for when choosing an implant dentist,” says Dr. Rapoport. Is your implant dentist a Board Certified Specialist? 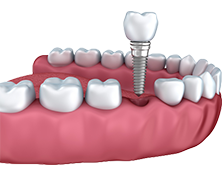 Dentists can legally place an implant even if they have only taken a one or two day course. It takes extensive training and experience in implant surgery to uniformly do a good job. A periodontist is a dental implant specialist who has taken two to three years of residency training after four years of dental school to learn the proper skills for placing dental implants. To become “board-certified” and then receive “Diplomate” status is earned only after passing a rigorous exam on dental implant procedures and other aspects of periodontics. Dr. Rapoport and Dr. Schuler are both board-certified and Diplomates of the American Board of Periodontology, a status that only 10 percent of the periodontists in the U.S. have achieved. Is there a list of the continuing education courses that your dentist has taken in the past 12 to 24 months? Technology advances, and it is important that your dentist is keeping up-to-date by doing sufficient continuing education. It takes about 50 to 100 hours a year in study of implant technology to ensure one's skills are refined and updated. Drs. Rapoport and Schuler regularly attend over 100 hours of continuing education courses each year to keep up-to-date and on the cutting edge. How long has your dentist been placing dental implants? As alarming as it may seem, any dentist with a dental degree can legally place an implant, even though surgical placement is not taught routinely in most pre-doctoral dental school programs. A specialist with surgical training has taken additional years of training to learn proper surgical skills. Drs. Rapoport and Schuler have been placing implants since 1999. They each have decades of experience with dental implants and stay abreast of all the latest developments in implant dentistry through regular continuing education. After all these years, they often face challenging situations that require the kind of extraordinary experience and skill that only comes with years of experience. How many dental implants does he or she place a year? You want your dentist to have sufficient experience to be able to handle all implant procedures competently, including complex situations. In order to reach that level of expertise, he should have placed many hundreds of implants. You want the dentist that places your implants to be experienced and knowledgeable in handling the most routine dental implant procedures, as well as the most complex dental implant procedures. There is a difference between someone that places 15 to 50 implants a year and someone that places hundreds a year, like Drs. Rapoport and Schuler do. What is their training in dental implants? Many dentists today take one or two day courses, or mini-residencies on dental implant placement, work on plastic model jaws and/or buy surgical implant kits to get started in dental implant placement. None of these courses require licensure or require the attendee to demonstrate surgical proficiency. Drs. Rapoport and Schuler have received extensive 3-year full time implant dental training from the University of Washington School of Dentistry, Seattle and decades of experience placing dental implants. You should always check to make sure your dentist has the proper training, experience and credentials. Experience matters. Does your dentist offer a comprehensive initial exam prior to diagnosis and treatment? Thorough preparation is the key to success in life, and dental implants are no exception. You should always make sure your initial exam includes the following evaluations: An oral cancer screening, an overall examination of the health of your gums, a complete bite evaluation including patterns of looseness and tooth wear and overall bite function. TMJ function, adequate size and shape of the bone and adequate amounts of gum tissue in the area of the proposed implant are important to check for. 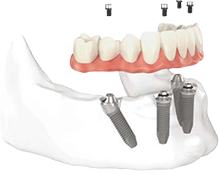 Proper implant preparation involves taking models of your bite and teeth for planning purposes and the creation of a surgical guide (template) that ensures proper implant placement. Our doctors use your 3D CT scan images to precisely plan the placement of your implant in special implant planning software. What type of safeguards are in place to protect against infections in Surgical Procedures? All surgical procedures carry a certain amount of risk for possible complications. Your dentist needs to be adequately trained and experienced in addressing all potential complications. Many nonspecialist offices perform surgical procedures, such as implant placement, using the same infection safeguards as are used in conventional restorative dentistry. Surgical standards to guard against infection are far more rigorous. At Pacific Northwest Periodontics and Implant Dentistry, all patients are full-draped for surgery and our team is thoroughly trained in optimal infection control procedures. How many dental implants does the dentist keep on hand (Inventory)? 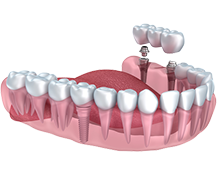 There are many situations that call for different implant sizes than were originally planned. A dentist that places hundreds of dental implants a year will always have 30 to 40 additional implants on hand to address unforeseen changes in your treatment situation. A dentist that only orders implants for individual cases may not be able to handle every situation that arises. Does the dentist have the latest technology to diagnose and treat? The dentist should be using advanced technology, especially a dental CT scanner, to diagnose and plan the implant placement. This ensures not only a faster procedure, but also a more effective course of treatment. What type and brand of implants does your dentist use, and how dependable are they? All implants are not of the same quality, and there are a number of offices that advertise inexpensive implant treatment. They can advertise this because, in almost all cases, the components used are not the top-quality brands. Ask yourself: Do you want an implant from a company that promotes being the low cost leader in dental implants or one that is from a worldwide leading company with 20 years of research and science? Our doctors use only the highest-quality, time-tested implant components from premium-quality manufacturers. These implants have proven themselves over several decades for long-term stability and biocompatibility. How many teeth do you need to replace? A Single Tooth? Multiple Teeth? All Teeth on One or Both Arches?